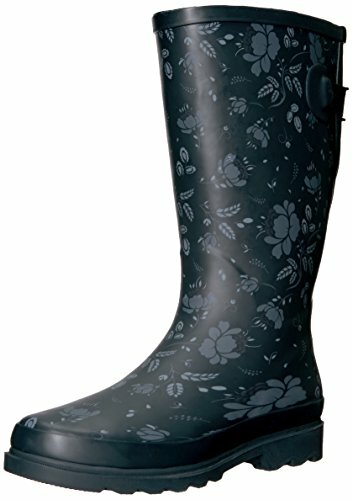 WATERPROOF RAIN BOOT | Our Western Chief Women's Wide Calf Rain Boots are made with rubber, which is waterproof and durable. The handmade vulcanized construction prevents weak spots in seams and allow us to design the fun prints we are known for! SOFT AND COZY LINING | We line our Feminine Floral, Black, and Raindrop Dot colors with soft, moisture-absorbing polyester/cotton blend lining to give comfort. The Buffalo Plaid color is lined with fleece, providing extra warmth. COMFORTABLE INSOLE | We know standing on your feet for extended periods of time can be hard. To help prevent aches, we use comfortable EVA insoles in our boots. The insoles are removable, making them easy to clean and replace. FUN PRINTS | Western Chief is known for making fun, family-friendly prints. Choose from a bright rainy print, elegant flowers, or be a little rebel in plaid! Don't like prints? No problem! Classic black is available. MEASUREMENTS | Our Western Chief Women's Wide Calf has an expandable gusset on the back. At rest, 16" is the circumference. It expands to 18" and tightens to an estimated 15". The shaft is approximately 12" from the arch. EASY CARE | We recommend cleaning your boots with a damp, warm cloth and mild liquid dish soap. A silicone conditioner can also be used. Air dry all boots. We suggest storing our boots in a cool, dry area to help prevent the boot from damage.